All that night the men stayed in their ship, toiling with their net; but not one fish did they catch. When morning came they drew near to the shore and saw a stranger standing there beside a fire of coals. He called to them and asked whether they had any fish. They replied that they had caught none, and he bade them cast their net into the water once more, this time on the right side of the ship. They obeyed, and now the net was filled. And immediately Peter wrapped his fisher’s coat about his body and jumped overboard to swim to shore, so eager was he to come to Jesus. The others remained in the ship and brought it to the landing. Then Jesus commanded them to bring some of the fish they had caught, and Peter drew the net from out of the water. In it they had taken one hundred and fifty-three large fishes, yet the net was not broken. Then Jesus asked the men to come and eat, for he had already prepared fish and bread on the burning colas. Simon believed that Jesus knew all things, and he felt sad because Jesus asked him this same question the third time. Then he remembered how only a short while ago he had denied three times that he ever knew Jesus. Now he declared three times that he loved him, and Jesus told him to feed his lambs and sheep. Simon Peter had heard Jesus speak a parable one day about the Good shepherd, who gave his life for his sheep. And he knew that Jesus had called himself the Good Shepherd. Now he understood that Jesus had died for the sins of the people, and he believed that men and women were the sheep whom Jesus meant that he should feed. Not their bodies, but their souls were hungry to be fed, and Jesus wanted Peter to leave his work as a fisherman and become a preacher of the gospel. In this way he could feed the people. By these words he meant that when Peter should grow old he would be put to death because he loved Jesus. 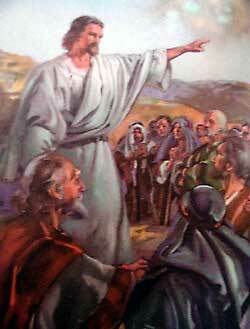 Forty days passed by, and during these days Jesus often spoke with his disciples about the kingdom of God. Still they did not understand that it would not be an earthly kingdom, like the kingdom of David had been. At last the time came for their farewell-meeting. During this time Jesus appeared to his disciples and “when they saw him, they worshiped him: but some doubted. While Jesus talked to them they were standing together on the Mount of Olives, and suddenly the disciples saw him being caught up into heaven. They watched until he disappeared from sight in bright clouds, after which they saw him no more. But still they stood gazing upward, hoping to catch one more glimpse of their departing Lord. Then they left the place and went into Jerusalem, into a room up-stairs, where they met together with other friends of Jesus to wait and pray until the promised Comforter should be given to them. No longer were they sorrowing; for now great joy filled their hearts because they knew that Jesus was really the Christ.